In a post earlier this year, we wrote about a drawing John Coltrane gave his friend and mentor Yusef Lateef, who reproduced it in his book Repository of Scales and Melodic Patterns. The strange diagram contains the easily recognizable circle of fifths (or circle of fourths), but it illustrates a much more sophisticated scheme than basic major scale theory. Just exactly what that is, however, remains a mystery. Like every mystical explorer, the work Coltrane left behind asks us to expand our consciousness beyond its narrow boundaries. The diagram may well show a series of “multiplicities,” as saxophonist Ed Jones writes. From the way Coltrane has “grouped certain pitches,” writes vibes player Corey Mwamba, “it’s easy to infer that Coltrane is displaying a form of chromatic modulation.” These observations, however, fail to explain why he would need such a chart. “The diagram,” writes Mwamba, “may have a theoretical basis beyond that.” But does anyone know what that is? Sound too far out? On the other side of the epistemological spectrum, we have physicist and sax player Stephon Alexander, who writes in his book The Jazz of Physics that “the same geometric principle that motivated Einstein’s theory was reflected in Coltrane’s diagram.” Likewise, saxophonist Roel Hollander sees in the tone circle a number of mathematical principles. But, remaining true to Coltrane’s synthesis of spirituality and science, he also reads its geometry according to sacred symbolism. In a detailed exploration of the math in Coltrane’s music, Hollander writes, “all tonics of the chords used in ‘Giant Steps’ can be found back at the Circle of Fifths/Fourths within 2 of the 4 augmented triads within the octave.” Examining these interlocking shapes shows us a hexagram, or Star of David, with the third triad suggesting a three-dimensional figure, a “star tetrahedron,” adds Hollander, “also known as ‘Merkaba,” which means “light-spirit-body” and represents “the innermost law of the physical world.” Do we actually find such heavy mystical architecture in the Coltrane Circle?—a “’divine light vehicle’ allegedly used by ascended masters to connect with and reach those in tune with the higher realms, the spirit/body surrounded by counter-rotating fields of light (wheels within wheels)”? As the occult/magical/Kabbalist associations within the circle increase—the numerology, divine geometry, etc.—we can begin to feel like Tarot readers, joining a collection of random symbolic systems together to produce the results we like best. 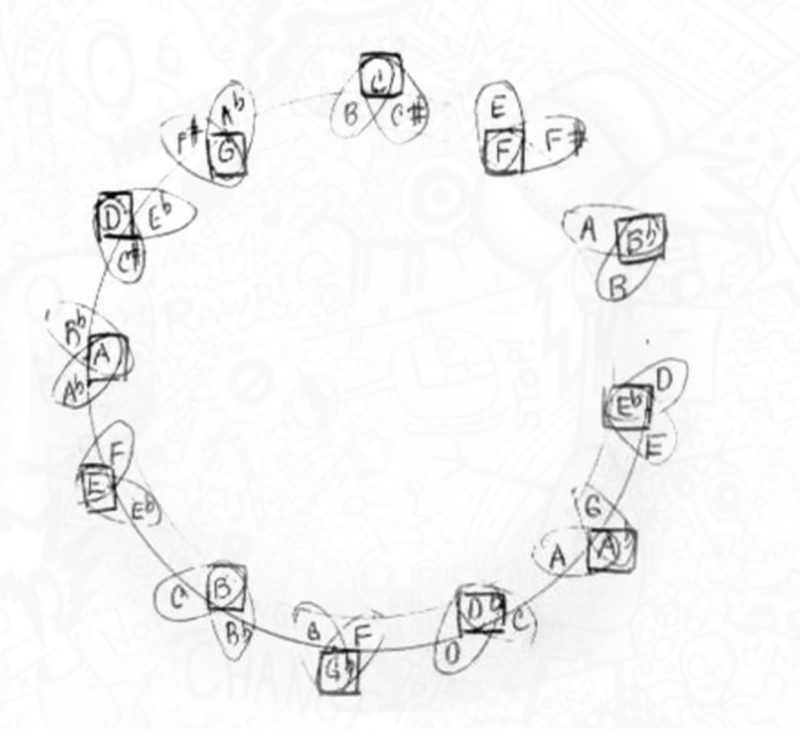 “That the diagram has to do with something,” writes Mwamba, “is not in doubt: what it has to do with a particular song is unclear.” After four posts in which he dissects both versions of the circle and ponders over the pieces, Mwanda still cannot definitively decide. “To ‘have an answer,’” he writes, “is to directly interpret the diagram from your own viewpoint: there’s a chance that what you think is what John Coltrane thought, but there’s every chance that it is not what he thought.” There’s also the possibility no one can think what Coltrane thought. The circle contains Coltrane’s musical experiments, yet cannot be explained by them; it hints at theoretical physics and the geometry of musical composition, while also making heavy allusion to mystical and religious symbolism. The musical relationships it constructs seem evident to those with a firm grasp of theory; yet its strange intricacies may be puzzled over forever. “Coltrane’s circle,” writes Faena Aleph, is a “mandala,” expressing “precisely what is, at once, both paradoxical and obvious.” Ultimately, Mwamba concludes in his series on the diagram, "it isn't possible to say that Coltrane used the diagram at all; but exploring it in relation to what he was saying at the time has led to more understanding and appreciation of his music and life." The circle, that is, works like a key with which we might unlock some of the mysteries of Coltrane's later compositions. But we may never fully grasp its true nature and purpose. Whatever they were, Coltrane never said. But he did believe, as he tells Frank Kofsky in the 1966 interview above, in music's ability to contain all things, spiritual, physical, and otherwise. "Music," he says, "being an expression of the human heart, or of the human being itself, does express just what is happening. The whole of human experience at that particular time is being expressed." Don’t see what all the fuss is about. It’s a circle of 4ths/5ths with each note flanked by its neighbors a half-step below and a half-step above. No big whoop. The “Circle of Fifths” only loops back on itself accurately because we all agreed on Bach’s suggestion to even temper our instruments. So yes there’s amazing physics involved, but not quite naturally occurring. Coltrane didn’t choose 5 octaves – that’s just what it takes if you fill in all the chromatic notes in the cycle of 5ths. There really is no mystery. These are the concepts of the Schillinger System of Musical Composition. Yuset Lateet studied it in Detroit and the symmetric system describes the Giant Steps progression. Schillinger fashioned his books after Einstein’s theories even namininf one of his books/ chapters the Special Theory of Harmony. Adding to what “Damn Skippy” said about it merely being the circle of fourths/fifths with the half-step chromatic neighbors above and below, notice that every other boxed note is placed on the outer circle (C, B-flat, A-flat, G-flat, etc.) and the others are placed on the inner circle (F, E-flat, D-flat, etc.). The separates it the 12 notes into the two whole-tone collections (inner circle and outer circle). By adding the chromatic neighbors to the opposite circle (e.g., “C” in the outer circle, and “B” and “C#” in the inner circle), it retains the division of the two whole tone collections. It seems to me that Coltrane’s diagram is illustrating that when going through the circle of fourths/fifths and by skipping every other one, you are in one whole tone collection, and is illustrating that each notes chromatic neighbor is in the other whole tone collection. So you all have figured it out, that’s nice. Myself I put on Coltrane’s “A Love Supreme” and enjoyed a relaxing evening. What a load of totally baseless, meaningless, mindless nonsense about ” science, physics, “geocentric”, “etc. Ridiculous !